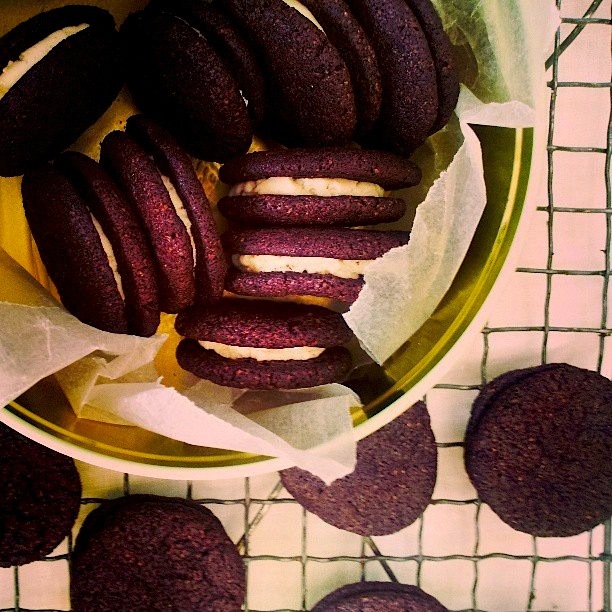 I’ve made these oreos for years, ever since I first bookmarked the recipe on Smitten Kitchen in 2007. In all the time I’ve made oreos, I don’t think I’ve ever made a single batch, I’ve always doubled the recipe. These are party, special occasion cookies and a single batch doesn’t cut it when you have hordes to cater for (or even when you don’t have hordes no matter how small the party these cookies will disappear). For my son’s eight birthday party I made two double batches. I had tins of oreos everywhere and a wild, rambunctious crowd of 28 – seven to eight-year-olds – plus their siblings and parents chewed through them in no time at all. Most of my son’s parties tend towards chaos (is this a boy thing?) but this particular party was the most chaotic in our small family’s history, despite an extra large tip, the poor Harry Potter party entertainer was traumatised by the end of the session (kids are cruel but he was a newbie party entertainer and he really did look nothing like Harry Potter) The four-year-old, sweet- toothed sister of one my son’s friend allegedly ate five oreos then escaped to the back of the garden clutching three oreos in both hands, before she was caught by her embarrassed mother and forced to give up her oreo booty. I’ve made oreos as part of my Christmas cookie selection a few times. They may not seem like an obvious choice for a Christmas cookie but they keep surprisingly well and are always a massive hit with young and old. If you make these oreos you will become an instant cooking hero. There’s nothing like the look of of delight on someone’s face when they see a tin of oreos baked just for them. Make no mistake, baking homemade oreos is a chore, I usually break up the work, bake off the cookies first and fill them the next day. Making oreos at home is not something you do every week or even every month, but every time you make them they are totally worth it. I’ve never met anyone who hasn’t had their minds blown by a homemade oreo. They will totally ruin you for the store bought oreos and everyone will think you are some kind of genius domestic goddess. You can also make bigger chocolate wafers, fill them with vanilla ice cream and make awesome ice cream sandwiches. Last weekend, I made some for a friend’s 11-year-old son’s pizza party, as he offered them to his guests he explained it perfectly – Homemade Oreos they’re awesome!!! Just like the bought ones only better. As I’ve already noted I have never made I single batch of these cookies. Whenever I’ve made the these cookies the dough has been slightly too dry. This isn’t meant to be a super wet dough but I’ve found it a bit too crumbly. This may have something to do with Australian cup sizes being slightly larger then American cups, as well as Australian flour being more absorbent of liquids so I’ve always added an extra egg and slightly more butter than the original Smitten Kitchen recipe to make a better cohering dough. Which is why I’ve got for this single batch recipe the slightly awkward amount of 1 1/2 eggs. 2 cups of sifted icing sugar. In a large bowl of a food processor mix together flour, cocoa, bicarb soda, baking powder, salt and sugar. On pulse, add butter then egg, continue pulsing until dough comes together. Shape teaspoons of dough into round balls, and flatten balls slightly with moistened hands. Bake for 9 minutes rotating trays once for even baking. Cool cookies on trays for five minutes before removing to racks to cool completely. To make cream filling, place softened butter and vegetable shortening in a mixing bowl and slowly beat in icing sugar and and vanilla. Then beat the icing for 3-4 minutes until light and fluffy. To assemble cookies. Fill icing bag with 1 cm icing tip with icing and pipe teaspoon of icing into the centre of cookie, place similarly sized cookie onto top and squeeze together, pressing so that the icing spreads evenly over the cookie. Continue until all cookies are filled. Will keep in an airtight container for 1-2 weeks.